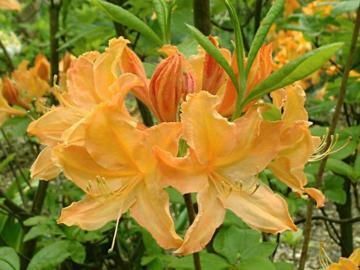 Profuse golden orange-yellow flowers, opening from darker buds in May. Compact bushy habit. Moist, well drained, humus-rich acidic soil. Best in part shade. Will grow in deep shade growth may become lanky. Strong sunlight tends to bleach the flower colour. Very hardy and resistant to mildew. One of the Northern Lights Hybrids raiseded by the University of Minnesota, USA, introduced in 1986.